Make your next giveaway something fun with this flask! 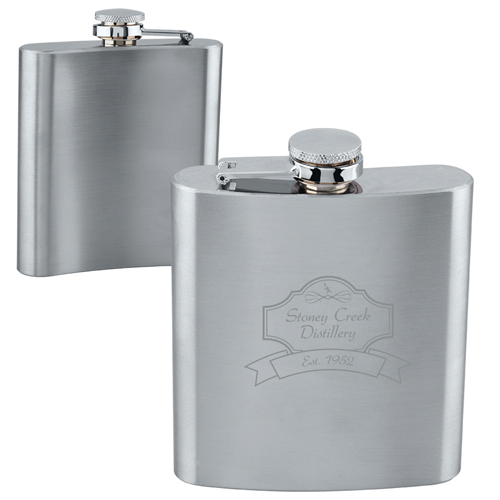 It holds 6 ounces (177 mL) of liquid, features a tethered screw on / off lid, and is constructed of 304 stainless steel. It's designed for use with cold and room temperature liquids only. While it is dishwasher safe, we recommend that you hand wash this and do not microwave. It's freezer friendly and may leak if tipped or held upside-down. Use our pad print imprinting method to add your logo or get copper laser engraving for a completed look. Your clients will love this! Polybagged / 25 lbs / 100 pcs. / 10x11x20box.